The Canadiens' 3-2 overtime victory in New York puts them right back in this series, a close-fought game that devolved into an absolutely wild final five minutes or so. Three goals in short succession sent it to OT then decided it—punch, counterpunch, sucker punch—and all three were deflections that could never in a million years be duplicated on demand. It's the welcome weirdness of playoff hockey, but it's also the ideal sequence to forge common ground between a new generation of numbers-oriented fans and older viewers who only care what their eyes tell them. Because all of the more basic possession stats—the remarkably simple math of comparing shot attempts—rely on an assumption that is essentially identical to one of hockey's oldest truisms: Put the puck on net, and you never know what's going to happen. The Rangers' extra-skater equalizer wasn't much more planned. Dan Girardi threw the puck toward the front, and Chris Kreider redirected it—away from the goalmouth, actually, but directly into the skate of Habs defenseman Alexei Emelin. And then, the winner. Everyone did everything right here: Tomas Plekanec took a shot with two Canadiens heading toward the net. Henrik Lundqvist made the save and directed it up and away—and right into the incoming torso of Alex Galchenyuk, crashing the net. Michel Therrien has said his Habs simply haven't been getting the bounces this series. This one, and two of these three, go a long way toward evening things up. Shooting percentages don't vary much in the NHL over longer spans—there was just a 3.2 percent difference between the league's best and worst teams in the regular season. It necessarily follow that shots (at least in bulk) are of similar quality, and it's the quantity that matters. The goals scored last night would agree. No one's going to argue that Briere's or Kreider's shots were of especially good quality, or that Galchenyuk possesses "clutch." But if you keep shooting—keep having the puck and therefore be able to shoot—sometimes, strange things are going to happen. It doesn't always shake out, of course. Sample sizes vex absolutes, as do on-point goaltenders. The Rangers solidly led the even-strength fenwick battle all night. 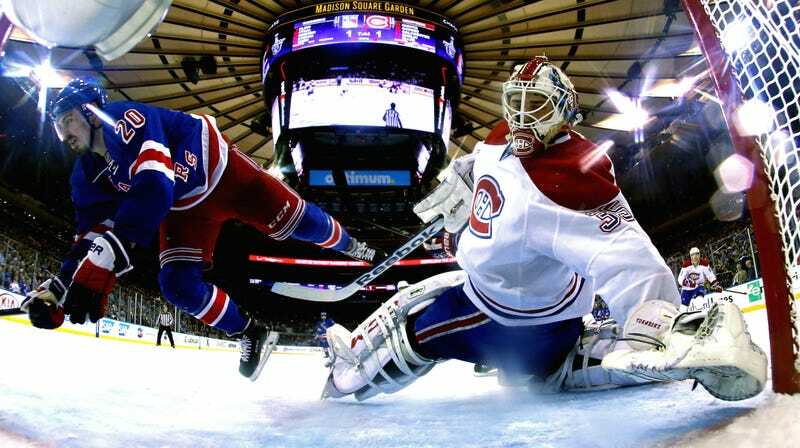 (Though it should be noted that lead was wholly gained in the first period, and Montreal dominated the third, with nine shots on goal to New York's four up until the Rangers pulled their goalie.) That two huge, late deflections went for the Canadiens and only one against is a perfect illustration of luck—an unscientific term that's nevertheless embraced and accounted for by the stats crowd. So, yes, Montreal has every chance of bringing this series down to the wire. Dustin Tokarski looked fantastic last night (and pretty good in Game 2), so they apparently needn't worry about being sabotaged by their goaltending. Their possession stats and zone entries are still troublesome—as is still being down a game, obviously—but as a short series gets shorter, the potential for a random, wacky event to influence the outcome grows. Someone, you get the bounces.